Saturday, December 10, 2011 - 17:43 By Calvin E. Johnson Jr.
Christmas was, once, a wonderful time that was celebrated with family, friends and dinner at Grandma's house. Grandpa would gather the children around the fire place and tell them the story about Jesus Christ who was born on Christmas Day. Some people, now, call it a "holiday." People stand in line at at malls, after Thanksgiving, then rush through the doors to buy, buy and buy more. Is this Christmas? Partly, but the following story is about the true meaning of Christmas. The year was 1919, one year after the end of World War I, and the people of Atlanta, Georgia were celebrating the Christmas Season. Many people attended Church and gave thanks to God for his many blessings. Folks, while shopping, were uplifted by sweet sounds of Christmas music played by the Salvation Army Band. There was a friendly and charitable atmosphere during this time of the year. The man who stayed with him until he recovered was his servant who had also joined the 14th Georgia Regiment, Company H. Bill Yopp was more than a servant; he and Thomas Yopp were friends who hunted and fished together. 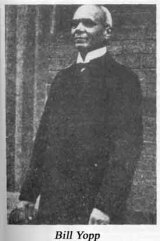 Bill Yopp, a Black Confederate, was sympathetic to the men of Atlanta's soldiers home who had been his compatriots in arms over fifty years earlier. During the War Between the States, 1861-1865, Bill Yopp was nicknamed "Ten Cent Bill" because of the money he made shining shoes. He did this for the soldiers at a dime a shine and ended up with more money than most of his comrades. These men, also, cared for him when sick. Just weeks before the Christmas of 1919, he had raised the money and Georgia's Governor Hugh Dorsey helped him distribute envelopes of three dollars to each veteran. That was a lot of money in those days. The old Confederates were speechless. Tears were shed because of Bill Yopp's good heart and kind deed. Many of these men had little or nothing. Bill was invited to come into the home's Chapel and say a few words. Bill Yopp was later presented a medal of appreciation for his support of the old soldiers and also voted in as a resident of the Confederate Soldier's Home. Bill died on June 3, 1936, the 128th birthday of Confederate President Jefferson Davis. He was buried at Marietta, Georgia's Confederate Cemetery with his compatriots.